Today, our country is undergoing a complex transformation, gradually transforming from post-Soviet to a European state. This is a difficult path, but walking it, we have important achievements worth greater public attention. 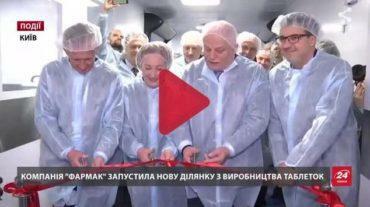 Among such achievements is that today Ukraine has its own robust pharmaceutical industry. Farmak JSC has been a leader of the domestic pharmaceutical market for 8 consecutive years. One year ago, the company’s management underwent significant changes: on 30 June 2017, Filya Zhebrovska left the post of General Director after 22 years of managing Farmak and headed the Supervisory Board of the Company. One year later, on 25 July 2018, Volodymyr Kostiuk was elected as Executive Director by decision of the Supervisory Board of Farmak JSC. In his exclusive interview to APTEKA Weekly, Volodymyr Kostiuk talked about Farmak’s further development. — Mr. Kostiuk, the editorial office of APTEKA Weekly congratulates you with the appointment to this high post. Could you please tell, if you feel great responsibility, as Farmak JSC is the leader of the Ukrainian pharmaceutical market? — Indeed, for me it is great responsibility to lead a company operating efficiently according to European standards, supplying its own products not only to the Ukrainian market, but also abroad: to the CIS, the EU, etc., constantly improving, implementing innovations in production and business processes. By the way, Farmak JSC has retained the leading position on the domestic pharmaceutical market in terms of sales in monetary terms for 8 years already (starting from 2010). Of course, for me, it’s important not only to retain Farmak’s leadership on the Ukrainian market, but also to strengthen the company’s existing positions in export countries and to increase Farmak’s presence on other markets. Speaking about the sales volumes of Farmak JSC, today, 75% of the company’s financial revenues are provided by the domestic market and 25% – by foreign markets. Countries such as Uzbekistan, Kazakhstan, Bilorus and other CIS countries are traditional markets for Ukrainian pharmaceutical manufacturers. It is no wonder, because these states, just as Ukraine, formed after the collapse of the USSR. Therefore, they have close economic ties, which condition the development of trade relationships. At the same time, we are developing our export potential in the terms of expansion of sales markets, including in EU member states. Currently, Farmak’s products are presented on markets of Poland, Germany, Latvia, Lithuania, Bulgaria, etc. Our company also supplies medicines to Asian markets. For instance, we have very good results in Vietnam; there are great expectations about expanding the range and volumes of products to be supplied to this country. We also make supplies to Iraq and Libya (the first lots were shipped just a week before). We are especially proud of the fact that last year, we began supplying Farmak’s products to Australia, but of course, we do not intend to stop here. — In 2017, Farmak JSC invited EMA inspectors to audit the bioequivalence studies conducted at the Clinical and Diagnostic Center of the National Pharmaceutical University (NPU). Could you please tell, why did you do this and whether Farmak obtained the expected results? — Since 2012, Farmak has conducted bioequivalence studies of individual generic drugs in NPU’s Clinical and Diagnostic Center. In 2017, our company invited the European Medicines Agency (EMA) to audit these studies. This was done for the prequalification of Farmak’s drug by the WHO. Currently, this prequalification process is in progress. By all means, the experience of prequalification of products by the WHO is very useful to us. But again, I emphasize that almost all Farmak’s sites are certified by European inspectorates, in particular Poland and Croatia. Indeed, a lot has been done over the years of Farmak’s existence. This includes quality assurance, innovations, and staff we are taking care of. But we always strive for more, for something new. For me personally, this is a real challenge. — You have long worked for Farmak JSC. Please tell about your career as top manager of a large modern enterprise. — I have been working for the company since 2008. In January 2018, it was my 10th anniversary here. I started as assistant General Director and worked very closely with Filya Zhebrovska. Then my career changed: I worked in the Internal Audit Department of the company’s Financial Unit, later – in the department engaged in the introduction of SAP accounting system. It happened so that prior to its launch I was appointed manager of this project and supervised the department for six months. It was a very difficult, transitional period. We replaced the previous accounting system with a new one. Of course, as usual, there were many issues and setup problems during the launch of the new accounting system. Five years ago, I decided to try myself in production. Internship took about a year. During this period, I had to review the standard operating procedures, quality assurance system, i.e. delve deep into manufacturing processes. After the internship, I took the position of Head of the Workshop for Liquid Dosage Forms. That is, building my career at this strong enterprise, I tried to plunge into various aspects of pharmaceutical production. I have a degree in Economics, graduated from Taras Shevchenko National University of Kyiv with major in “Economic Cybernetics”. Later, when I started working in the pharmaceutical industry, I decided to pursue the second higher education and entered the National University of Pharmacy. I have worked for about 1.5 year as Head of Workshop. That was great experience. I had more than 100 subordinates. Therefore, every day I had to communicate with specialists. Then I started to have some ideas. For example, we discovered insufficient capacity in the manufacture of certain drugs. My experience as Head of Workshop helped me, while at the post of Operations Director, to introduce a program to optimize the production process. Due to this program, we found out where capacities were used inefficiently. This program has been used for 3 years already; during this time, tangible results have been obtained. Just one year ago, we had a rather large list of out of stock products due to lack of capacity. Today, this list is several times shorter. This is the result of implementing the optimization program. I have worked for about 2 years as Operations Director. My competence included manufacture, all production support systems such as energy and water supply, equipment maintenance, certain functions of the quality assurance system, in particular validation and qualification of equipment, process documentation. Besides, after the launch of substances production in Shostka, this remote site was also assigned to the responsibility of the Operations Director. Since March this year, when Augustin Dubnička left the post of Executive Director out of family concerns, I was appointed acting Executive Director with 6 months of probation term. However, after 5 months of work in this capacity, given the company’s performance during this period, on 25 July, I was appointed Executive Director of Farmak JSC on a continuing basis. — Could you please tell about Farmak JSC’s innovations, directions of innovative activities of the domestic pharmaceutical manufacturer – the market leader? — As regards innovations, they can be both technological and managerial. I take primary interest in managerial innovations, meaning not introducing, but expanding managerial innovations to enhance efficiency. What we did before, should now be expanded for the company in general. What I mean is efficiency of using financial resources, equipment, energy. That is, now I would like to introduce efficiency of management decisions and optimize costs. Today, the pharmaceutical market is extremely competitive, not only in Ukraine, but also globally. To ensure competitive advantages, we need, in particular, to control costs. We must clearly understand the cost price of our products and respond to its fluctuations adequately. Currently, there are already a number of interesting changes implemented, through which we analyze both our and our competitors’ position. Based on this analysis, strategic decisions are taken. Clearly, the Operations Director cannot take strategic decisions, such as launching of a certain medicinal product on the market, alone. This takes a kind of cross-national team consisting of managers from various departments involved in development, raw materials, quality, marketing, etc. Therefore, this refers to all departments involved in the drug launching process. As a result, we have to make a product that would be popular, affordable, high-quality and efficacious at the same time. Today we work in such cross-national high-level teams taking joint decisions about who should do what to obtain goods results. Farmak JSC’s path began from Lomonosov Kyiv Chemical and Pharmaceutical Plant. Starting from 1995, the company pursued active transformations. This is certainly the merit of the former management, which invested everything in development and innovation. People put their heart and soul in this company, always striving to improve it. Only personalities with far-reaching vision can make the company a leader. For 10 years of working in the company, I remember ongoing introduction of innovations: upgrades of equipment, technological processes, development of new drugs, etc. By the year-end, we plan to expand the production of tablet forms and commission a site manufacturing solid dosage forms. They also use many innovative solutions, in particular, thanks to German equipment suppliers. We plan to expand facilities producing sterile dosage forms and will also work with companies offering innovative components. Right now, we are at the stage of selecting a supplier. Furthermore, we have laboratories developing both liquid and solid dosage forms. They also have a huge fleet of innovative equipment. In general, it should be noted that Farmak is not just manufacturing sites, it is a real technological cluster concentrating innovative solutions, from design to production. As regards expansion of the product portfolio, today we are considering two nosologies as a direction for development, namely bronchial asthma and mental diseases. Clearly, here we are guided by the National List of Medicinal Products. Ukraine’s pharmaceutical market is not very large. The healthcare system is undergoing significant changes. We generally support them, because the need for such changes is obvious. On the positive side – a new national ideology of the National List, a reimbursement system was introduced. Still, we would like the government, through the various ministries concerned, to maintain a dialog with local manufacturers. Personally, I have an impression that individual ministries are ineffective in contacting each other. What can we see today? The National List was introduced, but capacities of the Ukrainian pharmaceutical industry were not taken into account. Of course, this adversely affected the development of the domestic pharmaceutical industry. In particular, there could be much more new jobs and tax revenues to the budget, if the state procured its own high-quality and efficacious products. In this way, one would not have to complain about payment deficit in the country. The Ministry of Health should have notified domestic manufacturers in advance that the National List would include certain molecules and be based on clear priorities, so that they could adapt. At the same time, the Ministry should take into account that development of a generic drug takes 3-4 years. 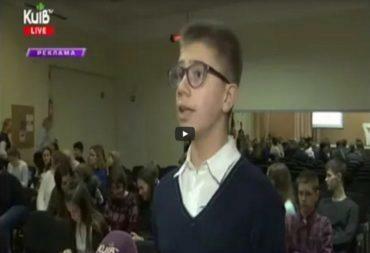 Such planning would allow Ukrainian manufacturers to take their place in the National List. This would lead to increase in production volumes and, consequently, increase in the number of jobs and tax revenues. At the same time, the state would save money and patients would receive affordable drugs with proven efficacy. — Thus, gradually, we touched upon problems. Could you please tell what problems of the pharmaceutical market are currently important for Ukrainian domestic manufacturers? What prevents the sustainable development of innovation? — As I have already said, the problem is that the state does not consider the capacities of Ukrainian manufacturers. There is no communication with us. I understand that the fight against corruption is currently in progress. But Ukraine has many reputed enterprises that work transparently. One should communicate with such companies. For instance, Farmak, which holds about 6% of the market, can provide expert advice. We can tell how certain aspects of the pharmaceutical market could be regulated better – not for our own benefit. 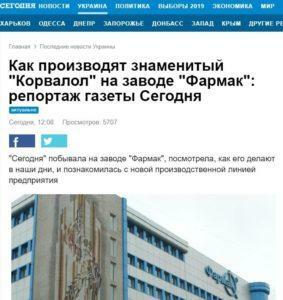 I would like to emphasize that Farmak employs patriots of Ukraine. We strive for cooperation for the sake of the future of our state. As for local problems of our company, now we are concerned about the situation with the protection of intellectual property rights. Take, for example, our “CORVALOL” brand, the name of which was created by the central laboratory staff of Lomonosov Plant. The first batch of this drug was released under plant order dd. 15.10.1960. Since then, Lomonosov Plant (and Farmak JSC as its successor) was the only manufacturer of “CORVALOL” brand in the former USSR. Since 1991 to date, Farmak JSC is the only manufacturer of drug in the former Soviet states. Of course, we invest in promotion of the drug under this brand, ensure its quality and affordability. We have the Ukrainian certificate for marks for goods and services and the decision of the Appeals Chamber recognizing the brand as well-known. It would seem that everything is fine. But another company began selling a drug under a very similar name. Another important problem is the National List. Today, it contains obviously obsolete molecules. They may be cheaper than modern ones if you consider the cost per tablet, but in terms of cost per treatment course, adverse reactions and delayed effects, modern molecules are more profitable than obsolete ones. In fact, they are being developed to improve treatment outcomes. There is a science called pharmacoeconomics dealing with the issue of whether obsolete molecules are more profitable that modern ones. And when the market has modern molecules, why form the National List out of obsolete ones? Pharmacoeconomics can prove the feasibility of including modern molecules into the National List. Developed countries also have similar lists. Each year they are reviewed, in particular, to include new molecules and exclude obsolete ones. This is done on the basis of pharmacoeconomic calculations. This is how it should be done in Ukraine. Instead, today the Expert Committee reviews the List on the basis of applications received from manufacturers. This process is quite costly, as it is necessary to collect evidence and justifications, while no guarantees are given. Therefore, manufacturers are reluctant to submit proposals to the Expert Committee and treat this issue with caution. We are currently preparing our own proposal to include a molecule in the National List. This means, we have to be very careful when preparing the information for the Expert Committee. We know that other companies have filed applications, which were simply rejected. This is an important problem today. — What strategic tasks are you planning to tackle at your management post at Farmak JSC? — Today, the former management is part of the Supervisory Board. It is a great honor for me to work with such people. Both I and other directors constantly feel their support. Support means a lot to us. A new young team came today. Its average age is about 38. They have lots of energy, knowledge, desire to do something useful. The former management initiated strategic sessions twice a year. They address various aspects of the company’s activities. Usually this is a plan for 5 years: sales, production, 5-year financial model. Together we consider, what our company should be like in 5 years. This year we have already approved this vision. That is, I know how many products Farmak JSC should sell in Ukraine and abroad over the next 5 years. I understand, in which direction the portfolio should be developed, what capital investments should be made. Sometimes we would like to plan for 7 years. However, this can only be possible with political and financial stability in the country. As regards strategic plans, in addition to improving the efficiency of management, as I have already said, our main task is to be competitive, not only on the Ukrainian market but also abroad. We plan to increase the share of exports to 40% in 2023. By all means, we must remain the market leader. We want to grow along with the market, retain, or better – increase our share in the pharmaceutical market of Ukraine.